Discussion in 'Player Guides, Tips and Tricks' started by ShelLuser, Aug 16, 2016. This guide will be a little different than the ones I've made before: it's going to be a multi-part guide. I'm doing this for two reasons: first to keep the guide easily accessible (going from easy scenario's to more complex), second to prevent one huge (harder to read) essay and most of all: because there are still areas which are new to me. For example: I've yet to learn more about the new Senior Staff service. However, I'm so excited about this update that I simply want to start right away. So multipart it is. I'm also going to include a "what ... if" section which hopefully makes it easier to find any specific answers you might be looking for. One of the most fundamental things to realize about playing on Empire Minecraft is that the mindset behind it is heavily (if not fully) focused on team play. There is the 'play your way' motto which most definitely holds true, don't worry: if you prefer to play alone / alone'ish then there's nothing stopping you. Even the anti-grief system fully supports this. But it can be more beneficial to work together. For example: mining together? Be sure to /invite everyone so you're playing in a group. Chances are high that you'll find yourself getting a Haste perk (you'll break blocks quicker) even though no beacon is being used. Monsters start attacking? If most of the group is now fighting you may even find yourself getting a Resistance perk to help protect the group even further. The Friends system is actually the center of EMC gameplay. Your friends are the people who you often play or chat with and who gain a little extra access to whatever it is you're doing. There's more at work here then simply getting a reminder that they've come online! For example: if you die outside town (waste or wild) then your items will be protected against pick-up from anyone for 8 minutes. Anyone but your friends... they can help to keep your stuff safe if they need to. And this idea now also finds its way into the new anti-grief system. But... It is still 'play your way': if you don't like the default settings (as explained in this part) you can completely change those (explained in a later part). Or better put: block protection. One of the most common problems on a Minecraft server is griefing. You build something with the intend to have it used by others, someone else comes along and only sees free materials and tears the whole thing down. 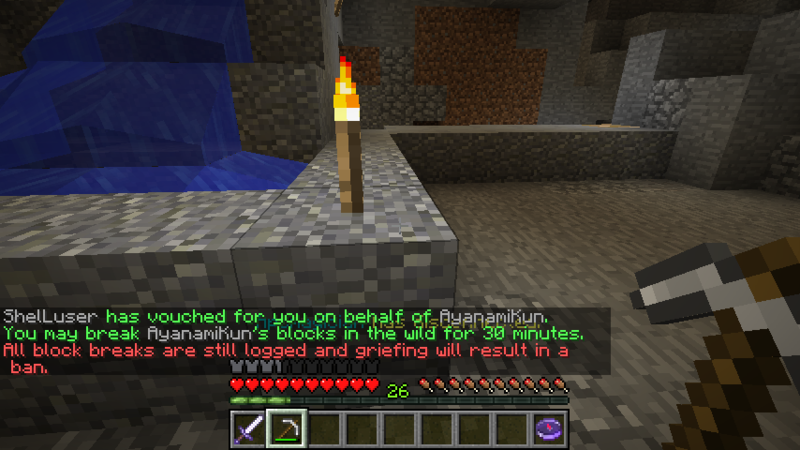 Now, griefing is against the server rules, so be sure to report it when it happens to you. If not for yourself then to help the staff protect others. But now we have the anti-griefing system to put a stop to this. Now, if you don't intend for anyone to break your stuff then you don't have to do anything. The system protected your blocks, the player(s) who tried to remove it know that they cannot remove them and so everyone can continue going about their business. But what if you did intend for the other person to break it? Maybe they're trying to help you out with building something? If you're sure that this player should have access to your protected blocks then you can /vouch for them. 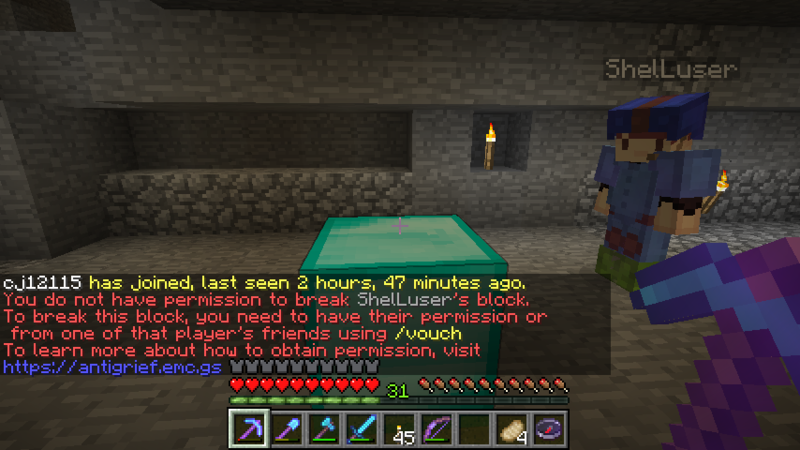 This will give the player access to all your protected blocks, but for a limited amount of time (30 minutes). 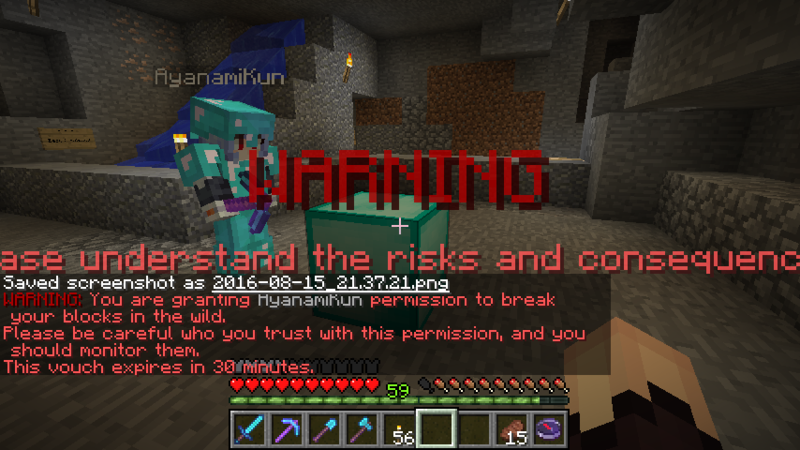 So in this case I used /vouch AyanamiKun. Please pay attention to this warning! Remember: all your protected blocks. So not just those in that area, but everything you placed while using /buildmode. So you should definitely be careful who you're vouching for. And when the player is done? Well, if you trust them you can simply let the vouch expire or if you really need to be sure then you can also /unvouch them. This will revoke any build trust which you gave them. Now Aya can finally break the block! /buildmode only works in the Frontier, not the wastelands. But fortunately for us block protection is active in the wastelands as well! The secret behind block protection is the selection of blocks which are protected by default. The so called uncommon blocks. Every time you place an uncommon block then that block becomes yours, no one but your friends will be able to break it. Even in the wastelands. Some examples of common blocks: crafting table, cobblestone, dirt, wood logs, wood planks, diorite, andesite, etc. If you place these blocks then that's that. They're placed and behave just like any other block in the waste. Then we have uncommon blocks. For example: furnace, stone ('cooked cobble'), stair blocks, fences, cobble wall, polished stone (andesite, diorite and granite), redstone building blocks, jack'o'lanterns. So say you want to build a house (mining outpost) but want to have it protected from griefing? Build it out of polished andesite, add glass, maybe use sea lanterns for lighting and you'll have a build which no one will be able to grief. You want to build a protected structure in the Frontier (Wild / Nether / End). Before you start building you turn on /buildmode : /buildmode on. Now every block you place will be protected. Be sure to turn this off when placing temporary blocks! You want to build a protected structure in the Wastelands (like a mining outpost). Build something using uncommon blocks. You want to place a chest and don't want people to break it. Just place it and be sure to let your friends know. The chest will be protected by default, only your friends can break it. Warning: the protection does not include the chest contents! For that you'd need a lock sign. You only want a selection of your friends to be able and break your stuff. Use the /fr blockbreak <playername> command, explained next time! You want to read the next part of this guide. EnderMagic1, Nickblockmaster, VoxelRay and 3 others like this. "Shell, It keeps you rolling"
ShelLuser and tuq1 like this. Your alt can't break your blocks, so that means.. *gasp* You aren't friends with your alt?! =o great guide. In the first part I told you that the Friends system is the essential part of the anti-Griefing update, and how it is even a central feature for playing on the Empire. I also told you that people in your friends list are capable to break your blocks because they are your friends. So... It might be a good idea to be a little careful who to add to your friends list, especially if you're heavily active in the Frontier. But what if you got yourself a nice protected building in the Frontier, and could really use the help of both a redstoner & decorator? Both are said to be quite good but... You're not fully sure yet if you'd like to be friends or not. Solution: /invite them to your group! Group leaders can use /gr blockbreak which allows members of the group to break each others protected blocks. The advantage instead of using the Friends system is that you'll have more direct control over what players can do. Once they're no longer part of the group they also no longer have access to any protected blocks (provided that they're not friends with a group member of course). Basically, once you see someone misbehaving all you'd have to do is /gr kick them and they'll no longer have any access to your buildings. This is why I think groups are an excellent way to provide access for other players without immediately adding them to your friends list (see /friends). The warning you'll get after using /gr blockbreak. Now, this does raise a small concern... This setting involves all members of a group. So it's not merely an issue of group members being able to break the protected blocks of the group leader. This setting also allows group members to break each others protected blocks as well. So... including yours if you happen to be part of that group. Fortunately you can control this behaviour yourself using the /ps command, which I will explain at the end of this part. One of the awesome things about the Empire is the international community which has formed around it. Players from all parts over the world are playing here, and if you don't believe me then please check out the Flags shop. One of the reasons why it has so many country flags is because players from all those countries are actually playing on the Empire! But that also comes with a downside.. Different parts of the world have different timezones. So it's not that uncommon for players to only be able and meet up during the weekends, simply because their timezones are too far apart for playing during the week. So lets say you run an outpost and one of your members has an excellent idea for an expansion... The only problem: you're not ready to give them full access to all your protected blocks yet. But you also don't want to make them wait until next weekend before they can build their expansion either. The solution? Ask one of your friends to vouch for them! 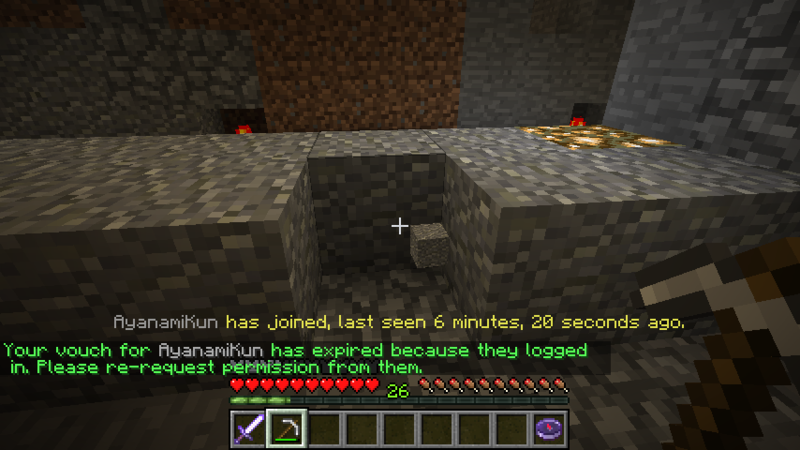 In the previous part I showed you guys how I could give AyanamiKun temporary access (lasts for only 30 minutes) to my protected blocks without befriending her. The only thing I had to do was to /vouch for them. The advantage is that it only lasts for 30 minutes and I can always /unvouch them if I need to. This is also something which your friends will be able to do on your behalf. 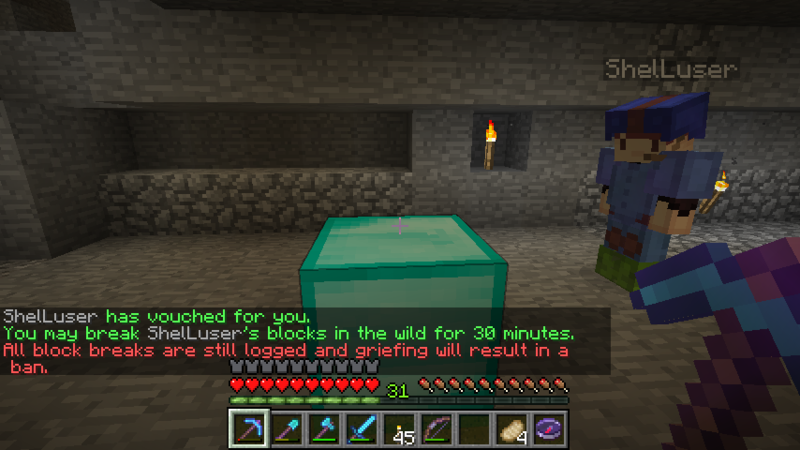 The anti-Griefing system hard at work! And so GripCEO turns to me for help. 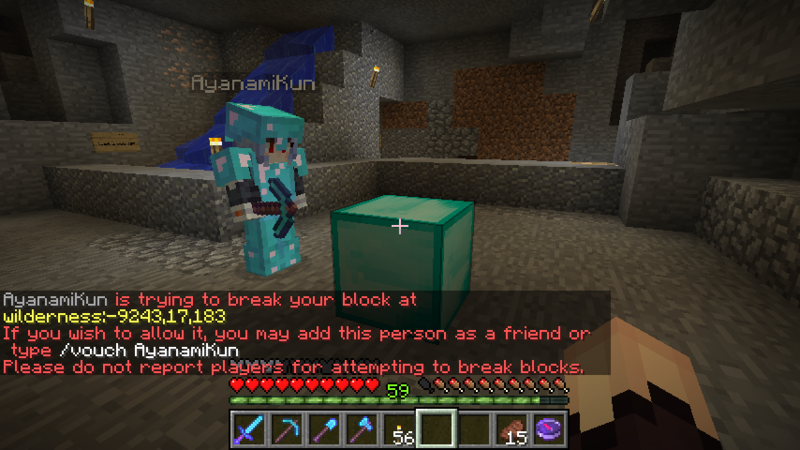 After having bribed me with access to a pyramid made out of diamond blocks, errr convinced me that this really requires re-alignment I decided to give him temporary access to Aya's protected blocks. Something which I can do because I'm her friend. 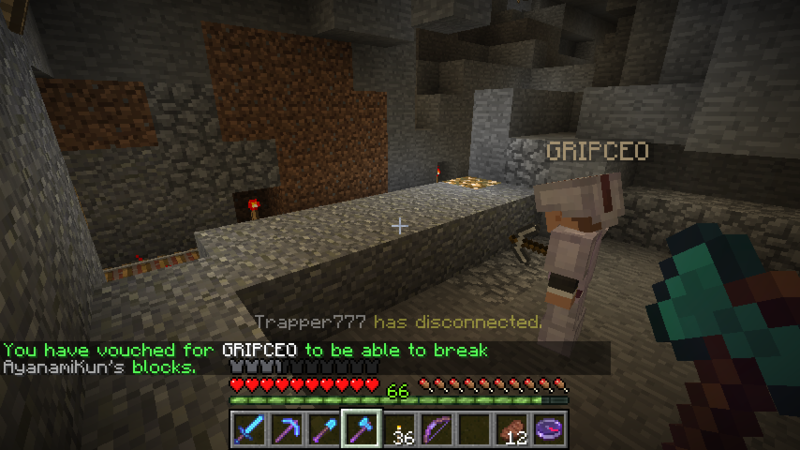 Although GripCEO has access to Aya's blocks, griefing her would still be severely punished! 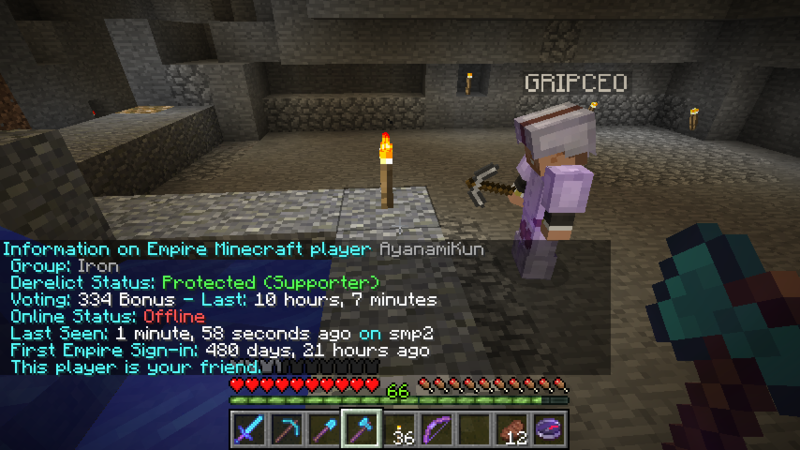 Warning: Please be fully aware of what's happening here: by vouching for GripCEO I'm basically giving him temporary yet still full access to all of Aya's protected blocks. This is not to be taken lightly, because if someone abuses this access to grief then you will find yourself in just as much trouble as they will be! My 2 cents? The only time you should be using this is if you're 200% sure that this is all ok with your friend. Preferably if they asked you to vouch for them on their behalf. Remember: just because you can use something doesn't mean that you also should... Maybe food for thought? Stay in control: play your way! One of EMC's key motto is play your way, something I've been referring to a lot myself as well. As you might have guessed this anti-Griefing system is no different. Warning: allowing friends to vouch for you is normally on! Using /ps you'll gain access to the Anti Grief section shown above. 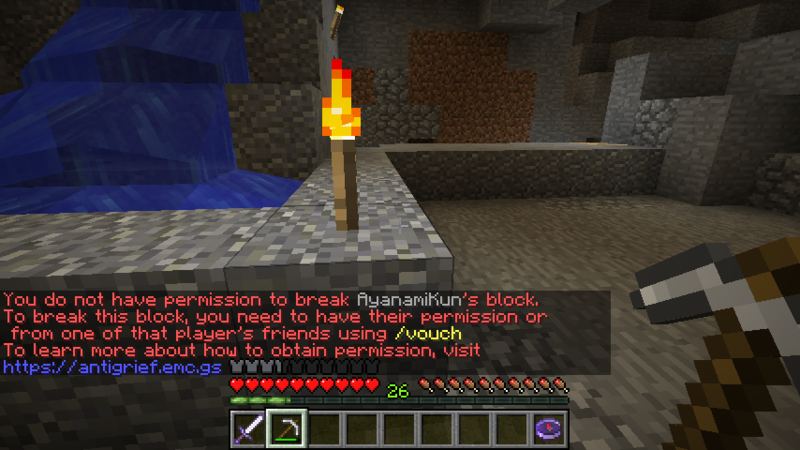 Here you can control if you want to allow group members to access your protected blocks (only applies when /gr blockbreak is toggled), if you want all your friends to have access to your protected blocks and finally if you want to allow your friends to give other players (temporary) access to your protected blocks. As you can see I do not allow my friends to vouch for me (sorry guys! ). You want to give some players temporary -but controlled- access to your protected blocks. /invite them to your group and then use /gr blockbreak. This allows all group members to break your protected blocks (and optionally each others blocks as well). If players misbehave you can use /gr kick to remove them from the group, this will also revoke their access to your protected blocks. You want to give someone else ("PlayerA") temporary access to your protected blocks, but you can't be there to set up a group. Ask one of your friends to vouch for them on your behalf. All they have to do is use: /vouch PlayerA YourName. For example: if Aya wanted to vouch for GripCEO on my behalf she'd use: /vouch GripCEO ShelLuser. Make sure that the player you're vouching for does not abuse their access. If they do then you will be just as much responsible for any griefing as they are! You do not want to use the default behaviour where all friends have access to your blocks, where group members could gain full access to your blocks and where friends can give other players access to your blocks (which are the default settings). Use the /ps command, click on the Anti Griefing section and change the settings accordingly. You can change this for only the server you're on or for all servers at once. You want to read the 3rd part. Just scroll down already, silly! ANubIsWe3, Jelle68, EnderMagic1 and 2 others like this. In the previous part I showed you guys how you can use the groups feature to allow players to gain access to your protected blocks without befriending them. This can help you to create a group so that they can change your existing building. But one major problem remained: all placed blocks would be owned by different players. Not a problem if you're all friends, but what if those were random strangers who helped you out? This section has become obsolete; the current behavior is that when group building is turned on then every group member will co-own the blocks placed by the group. So basically you can build something together and also maintain that building together afterwards. I'll soon post an update! Normally all your friends (see /fr list) can break your protected blocks and they can also vouch on your behalf (see previous parts: giving someone else temporary permission to break your protected blocks). You can easily control this using /ps but that applies to all your friends, so should you now limit your friends list to only those you want to entrust with this? My current /ps anti-grief settings. Fortunately you can fully control this! And the same can be used for the block breaking ability. When Aya got tired of having to constantly befriend me I quickly started using this feature to prevent my costs from getting out of hand: /fr blockbreak AyanamiKun off. This makes sure that Aya won't be able to break my protected blocks even though she's my friend, who can break by blocks by default (as seen above). So basically you can go either way with this. Either you allow everyone in your /friends list to /vouch or break your blocks and then simply deny a few this privilege. Or you can turn this around by allowing no-one access and then simply enabling this for some specific friends. If you want to change things back to default then you can use the command without any parameters, or use auto. So: /fr blockbreak AyanamiKun would reset the behavior back to whatever I specified in /ps, as would: /fr blockbreak AyanamiKun auto. And of course the same applies to /fr vouch. 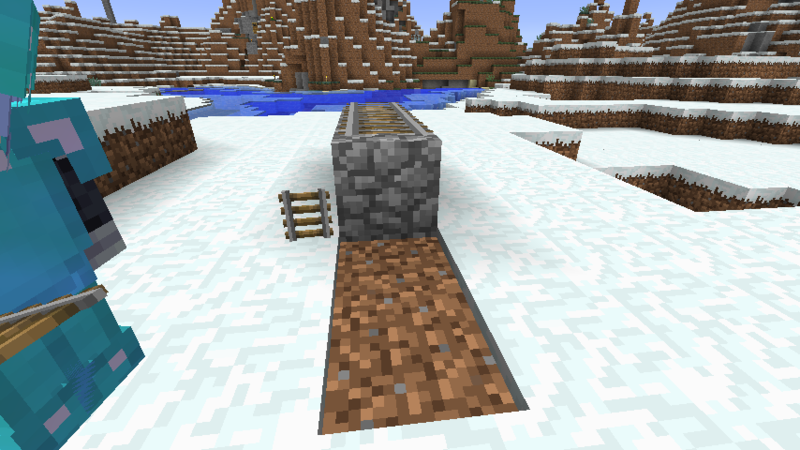 So if you're building a railroad always make sure that you also protect the flooring by replacing it with uncommon blocks or by using /buildmode and then simply removing and replacing those blocks. Note: this is something which might change in the future, Aikar already mentioned to be looking into this. Use /staff and ask a moderator for help. If needed (and within the rules) then they can help you remove unwanted blocks. There are some rules and restrictions of course, and if the player is still active on the Empire then the best thing to do is to ask them first. First disallow every friend to break your blocks by using /ps (see Anti-Grief section). Then use /fr blockbreak <friendname> on for those you'd like to have this ability. Note that you can also easily turn this around: disallow this feature for only those friends you don't completely trust (yet). You know how to limit your friends from breaking your blocks, but now you wonder about them vouching for you.. The same as the previous point applies. But instead of using blockbreak you'd now use vouch: /fr vouch <friendname> on/off/auto. (on or off turn the feature on of off, auto will reset it to default behavior). Just ask! There's no such thing as a stupid question, the only thing stupid is wondering about something without speaking up. I'd be happy to try and help you out! This concludes my guide so far. Should even more features or changes get released then I'll certainly follow up on that. As mentioned I might post a 4th part containing several tips and tricks, but I'm not fully sure about that one yet. If you want to make sure that your new (upcoming) building is fully protected in the Frontier (/wild) then use /buildmode on before you start building. When active then all blocks you place will be protected. Only your friends will be able to remove your blocks (see /friends), but if you don't like that then you can change this using the /ps command. And if you have existing buildings in the Frontier which you'd like to have protected then you can request the help from Senior Staff. It'll cost you around 10k per structure, up to a maximum of 50k (depending on the structure) If you want to apply for this please fill out this form. ._. and how do you keep this in your head? Thanks for the post! It is really helpful!